Minnesota has ended Boston University’s season in each of the last two years, defeating the Terriers in the national championship game in 2013 and then eliminating in the 2014 NCAA quarterfinals; both games were played at Ridder. BU will be looking for a much better outcome this time around. They should come into the season as a hungry team, whose younger players got some good experience in key roles last year and whose veterans will be looking to guide the team to a national championship. It’s probably pretty safe to assume at this point that the road to the national title will run through the Gophers, so the Terriers will want a big showing from the entire team in this game. They’ll need an especially big performance in goal, from whoever ends up starting–their questions in the crease will need to be answered before they have any hopes of winning a title. Minnesota, too, will be looking to make a statement here. The Gophers did not end the season the way they’d hoped last year, as their bid for a three-peat was denied when they were upset by the Clarkson Golden Knights. They don’t want to get off on the wrong foot this season, and a good outing against BU would quiet whatever doubts there are. The Terriers’ top-six should be able to match Minnesota’s, though the Gophers’ defense is superior when it comes to both depth and skill. Minnesota’s goaltending situation, however, is almost as intriguing as BU’s, with Amanda Leveille aiming to bounce back after a less-than-stellar showing at the Frozen Four last season. The nation’s defending champs will open up the season with a home-and-home series against St. Lawrence, who’s always a tough out for fellow ECAC opponents. 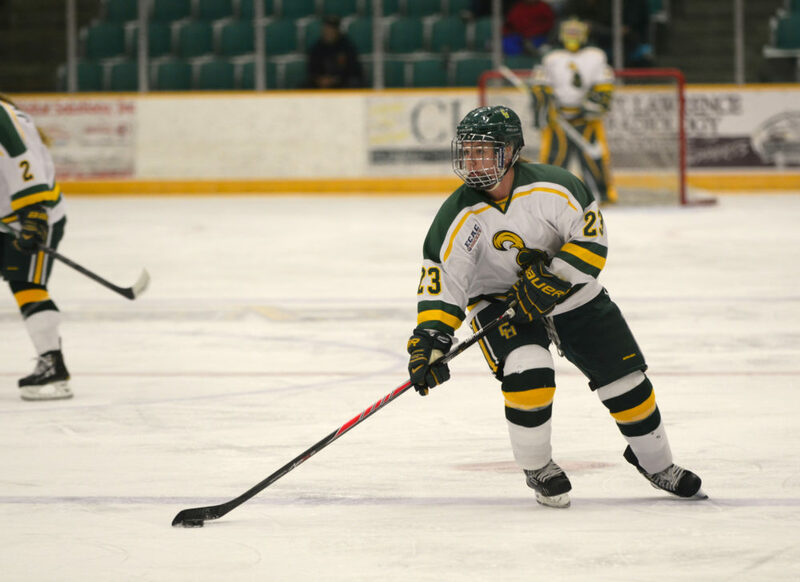 Clarkson will head into the year with a revamped offense and a brand new netminder after losing several key seniors from last season. They’ll be looking for good performances from their top-six and freshman goaltender Shea Tiley, as well as junior defenseman Erin Ambrose. Ambrose has produced at a remarkably high pace throughout her first two seasons but she’ll carry an even bigger load this year as a leader in all areas. We’ll also see our first big-time conference match-up of the season with Wisconsin heading to Duluth to face the Bulldogs. The Badgers looked dominant last weekend against Lindenwood, but they’ll be facing much more firepower and depth in this Minnesota Duluth team. This is a very early but nonetheless significant test for Wisconsin’s defensive corps, which is short on high-end talent and will not have Alex Rigsby to rely on in net. If these match-up do come down to goaltending, however, the Badgers’ Ann-Renée Desbiens holds the advantage over the Bulldogs’ Kayla Black. Vermont and RPI will both face North Dakota and Bemidji State in what should be another few interesting non-conference match-ups. The Beavers are coming off a road sweep of Robert Morris, so they’ll be looking to keep the momentum going. The Catamounts and Engineers are aiming for a couple of big road wins; how UVM measures up this weekend will be especially intriguing. They’ve got several top-six players that could make things difficult for opposing defenses, but will perhaps want a little bit better performance out of goaltender Maddie Litchfield after an exhibition loss to McGill last week. After being swept by Bemidji State last week to open the season, the Colonials will want a strong showing on the road against Maine this weekend. Robert Morris is adjusting to several big losses on the back-end, so a slow start coming out of the gate isn’t entirely unexpected. Senior defenseman Erin Staniewski had a big weekend against the Beavers, scoring her first two career goals, but the team will need more production out of top forwards Rebecca Vint and Brittany Howard to kickstart the offense. Gabriella Fundaro also provides coverage of the women’s game over at At Even Strength.